Audi has unveiled the estate version of its new A6 ahead of orders opening this summer. 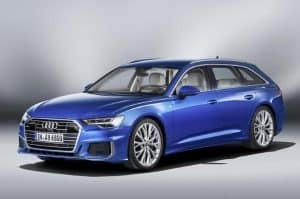 Just like its recently revealed saloon counterpart, the A6 Avant boasts striking looks, a spacious interior and a comprehensive package of safety systems. It will come driven by a range of powerful four-cylinder and six-cylinder engines, backed up by a mild hybrid system based around a belt alternator starter that recovers energy during braking. These engines can also switch themselves off whilst coasting at speeds of between 34mph and 99mph to conserve fuel, while an enhanced start-stop function becomes active above 13mph. Again just like the standard A6 saloon, the Avant is larger in every direction, stretching for 4.94 metres and measuring at 1.89 metres wide and 1.47 metres high. This makes for a cabin that is even more spacious than before, with best-in-class front and rear elbow room and rear knee room. Boot space remains unchanged from the previous A6 estate, with 565 litres of luggage space, increasing to 1,680 litres with the standard 40:20:40 backrests folded down. The boot lid itself can be opened electrically, while an optional sensor enables the tailgate to be opened using a simple movement of the foot. Exterior colour options extend to a palate of 12 shades and only two spec levels will be available in the UK: Sport and S line. In terms of safety, the A6 Avant is available with the ‘city assist’ and ‘tour’ packs. The first comes with the new crossing assist system, while the latter offers adaptive cruise assist, which supplements the adaptive cruise control with gentle steering intervention to keep the vehicle in lane.